Skyscrapers are always conceived to be vertical structure as landmark of cities all over the world. The only way to be the best is to continuously building taller structure. There is no end to this race and no one will be the best because there will always be a taller structure to break the current record. It is in fact a very immature game trying to beat your competitors by simply constructing the tallest building in the world. 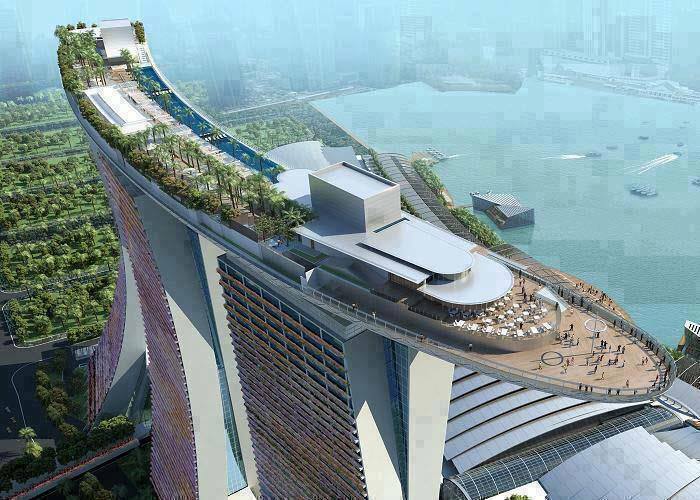 Moshe Safdie has challenged the notion of skyscrapers with his design for Marina Bay Sands in Singapore. It is not the tallest building in the world but a very interesting structure indeed. It consists of three towers tapering upward and linked by a huge spaceship like public park horizontally that punctuate the structure at the top. The dominant feature of this building is its horizontal component instead of the vertical one. In terms of forms, it can be considered as the prototype for future skyscrapers across the world. While in the context of functionality, it manages to connect 3 tall buildings to create a usable public domain in the sky.